UrbanSim is a PC-based training simulation for practicing mission command in counterinsurgency operations. It comprises a practice environment, a web-based multimedia primer on doctrinal concepts of counterinsurgency and a suite of scenario authoring tools. The UrbanSim practice environment allows trainees to take on the role of an Army battalion commander and to plan and execute operations in the context of a difficult fictional training scenario. After developing their commander’s intent, identifying their lines of effort and information requirements, and selecting their measures of effectiveness, trainees direct the actions of a battalion as they attempt to maintain stability, fight insurgency, reconstruct civil infrastructure and prepare for transition. UrbanSim targets trainees’ abilities to maintain situational awareness, anticipate second and third order effects of actions and adapt their strategies in the face of difficult situations. UrbanSim is driven by an underlying socio-cultural behavior model, coupled with a novel story engine that interjects events and situations based on the real-world experience of former commanders. UrbanSim includes an intelligent tutoring system, which provides guidance to trainees during execution, as well as after action review capabilities. UrbanSim is being used and evaluated in an increasing number of U.S. Army training contexts, including in courses at the School for Command Preparation and the Command and General Staff College. 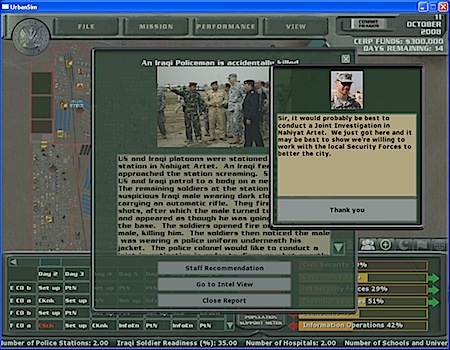 UrbanSim has also been utilized by operational U.S. Army units to provide an opportunity for staff members to work together and improve their coordination skills. He entered a larger space full of projection-room gloom with shadowed figures seated facing a holographic focus on his left. McKie identified Jedrik by her profile, slipped into a seat beside her. McKie recognized the subtle slippage of computer simulation. That was not a flesh-and-blood Broey in the focus. Via UrbanSim at USC Institute for Creative Technologies.